Pay attention to signs of heat stress in horses and dogs. If a dog doesn't have water, it will dehydrate even more quickly than the horses, simply because it cannot sweat to cool itself. "Dogs do a lot more running; they are traveling more miles than the cattle or the horses," Walker points out. 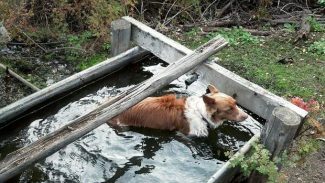 They can overheat quickly on a hot day if they don't have some water along the way to flop into (like a stream or water tank). Randall says dogs' respiration rate goes very high because they can't sweat; they have to pant faster to try to cool themselves. "Their body temperature can get so high that if they are dehydrated they will go into convulsions. Once that happens they die very quickly. If you have dogs that are really hyper, leave them at home on a hot day." That's when you need the dependable ones that won't do anything extra without your command. Horses are also susceptible to heat stress if you overwork them in hot weather. "If they are in good shape, and fit, they can stand a lot of work. But a soft horse on a hot day climbing hills and sweating a lot may get dehydrated and overheat," says Randall. If it's hot and humid, sweat doesn't evaporate as readily, the horse doesn't cool down, and sweats more to try to cool himself—and becomes more dehydrated. "If the horse has been sweating, and has now stopped sweating, that's a clue he's too dehydrated to sweat. If you quit working him at that point, and get him cooled down, he might be ok, but if you keep asking him to keep going—and he's been a long time without water—you may end up losing that horse," Randall says. Some people don't let their horses drink when they are hot and sweaty, for fear of colic or founder, but horses need to drink or they become dehydrated. "We were taught to not water a hot horse, but water should not be withheld," says Randall. A lot of cold water all at once can cause the gut to cramp, but warm water is safe. "If water is cold, limit the horse to about a gallon and then give him a little time, and then give him another drink. Count swallows as the horse drinks, and limit the horse to about 15 swallows. After a break, let him have another dozen or so swallows—and keep spacing out his drinks," advises Randall.